Bagel and Cookie are not related, but they are deeply bonded. Cookie is a Pocket Beagle measuring only 12 inches and weighing 15 lbs. She is delicate and frightened as she leans against Bagel. The two beagles were surrendered at Palo Alto Animal Services by their owners who had become homeless. The distress of these two 10-year-old dogs was apparent. Cookie never moved from Bagel’s side and shivered uncontrollably for the first two weeks they were in the kennel. They barked almost constantly and that, together with their elderly status, made adoption difficult. We decided to foster Bagel and Cookie when it was apparent they were anxious and not thriving. Their adaptation to our household was another thing: we had not taken proper steps to introduce these two kids to our resident beagles, and so all the challenge of territory and hierarchy emerged. The evening walks were quite a spectacle as Geoff was pulled along by our pack of four strong, energetic beagles. 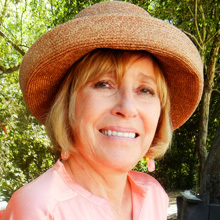 We attended the Saturday afternoon meetings at the Humane Society of Silicon Valley (HSSV) in Milpitas and there met the wonderful Linea McPherson, President of Nor Cal Beagle Rescue. Linea decided to take them under her care while leaving them in our home as fosters, and so we settled in, waiting for the right home to appear. In a magical coincidence Pam Warrior, a vet tech at Stanford Animal Hospital, saw a poster with a photo and description of Bagel and Cookie. Remembering Gwen, a client who had lost her two beloved beagles 2 years before, Pam made the phone call, encouraging Gwen to visit Bagel and Cookie. When Gwen dropped by two days later, it was love at first sight! The connection between Bagel, Cookie, and Gwen was instantaneous, and our two foster kids went home with her that day! Since then we have seen them at a Beagle Meetup and Gwen has sent us photos of the two nestling together in their new home, as happy as any dogs can be. 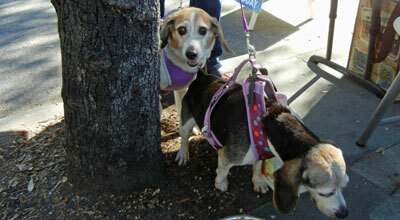 This was a miracle match up; finding a perfect home for a bonded pair of elderly beagles is not easy. Gwen still had that empty place after losing her two pets and she was now ready to bring these two little souls into her heart.